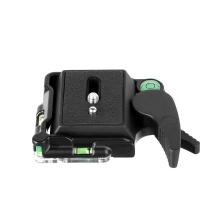 Removable quick release plate wit 1/4 inch screw thread on the top, can be linked with various cameras, DSLR and so on. With 1/4 & 3/8 inch screw hole on the base of tripod head clamp, to link with all kinds of ballhead or tripods and other adapters. Built-in rounded bubble level and three-dimensional bubble level for you to find the balance accurately and quickly. Made of premium aluminium alloy material, durable. With anti-slip rubber pad on the plate, dual-locking latch design, keep your camera safe. With fast plate locking lever, easy to install and remove. Only the quick release plate is included.